I've been packaging all sorts of gifts in the Mini Pizza Boxes...apart from 3"x3" notecards, 4 tealight candles fit really well (wrap in washi tape to pretty them up), and so do soaps, chocolates and cookies to name just a few ideas. They are so easy and quick to assemble (no adhesive required!) are lined with a food-safe coating, and don't require much decorating either. What could be better? 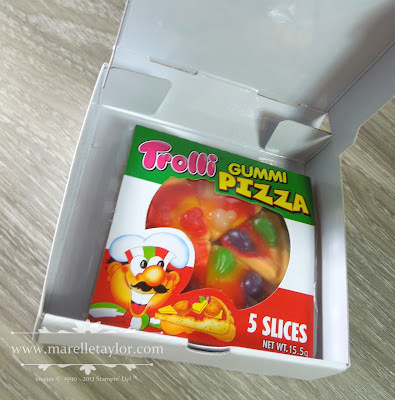 I was pretty excited when I found the perfect filling for this box - a gummi pizza! Cute as a button! You can find these in Kmart and BigW (in Australia). What a sweet gift!